A prototype artificial skin used to heal wounds has been developed by British researchers. Writing in the journal Regenerative Medicine, UK-based company Intercytex said it had produced promising results in early trials. It said the skin seemed to incorporate itself much better with real tissue than any other skin substitutes tried in the past. The researchers hope it might provide an alternative to skin grafts. Currently the best way of treating serious burns and large wounds is to take skin from part of a patient's body and graft it on to the damaged area. But this is not ideal, and there have been attempts to create a form of artificial skin. However, some doctors say that the failure of these to fully integrate with the wound have rendered these efforts of limited value. Intercytex believes its latest version weaves into wounds much better. 1. ICX-SKN is produced from fibrin gel, a blood clotting protein and fibroblast cells, found in human skin. 2. 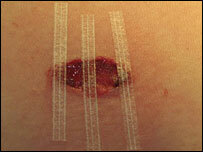 The artificial skin can be cut to fit the wound and held in place with steri strips. 3. After four weeks the dressing is removed and the wound appears to have healed with little scarring. 4. A cross-section of the scar under microscope reveals little difference between the old and new skin. The skin is created from a matrix made up of fibrin, a protein found in healing wounds. 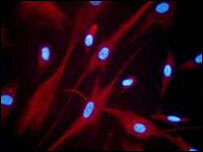 To this is added human fibroblasts - cells used by the body to synthesise new tissue. In a process that effectively replicates the way the body makes new skin, the cells produce and release another protein, collagen, which makes the matrix more stable. It is in this form that the "skin" is implanted into a wound. The researchers say that because the matrix is in a stable form, it is more able to withstand changes that take place during the healing process. The fact that the collagen is synthesised directly by the cells themselves also more closely mirrors the natural healing process. In tests researchers cut an oval section of skin from the arms of six healthy volunteers and replaced it with their lab-grown skin. After 28 days the artificial skin had remained stable and the wounds had healed with relatively little scarring. Dr Paul Kemp, Intercytex's chief scientist, said: "I was very surprised at how quickly the wounds healed. "If this continues in larger trials then it could revolutionise the way in which wounds and burns are treated in the future." Dr Kemp has been working with Ken Dunn, a consultant surgeon at the burns unit at Wythenshawe Hospital in Manchester. Mr Dunn said: "This particular product behaves like the patients' own skin. "It seems to excite much less reaction than the other materials we are using at the moment. "If this is borne out in larger clinical trials then we would be very interested in using it with our patient group." Others, however, have warned it is easy to heal a small, surgically-created wound in healthy volunteers, and that the true test will come when the technique is tried on real patients with real burns. Dr Phil Stephens, an expert in cell biology at Cardiff University, said: "Future studies are needed to establish whether this system is substantially better then those already on the market. "But this skin replacement system has the potential to dramatically reduce scarring and help heal chronic wounds in aged patients to give them a better quality of life."